A wide-ranging and friendly journey through H.P. Lovecraft’s tales of cosmic terror and wonder, the Tour de Lovecraft is the ideal companion to the work of the twentieth century’s greatest American horrorist. Kenneth Hite has spent decades reading and re-reading Lovecraft and his heirs, slipping through their forests of verbiage to discover the solid literary ground beneath. With his game designer’s eye for structure and connection, in this book he reveals the threads and themes that run throughout Lovecraft’s masterpieces. 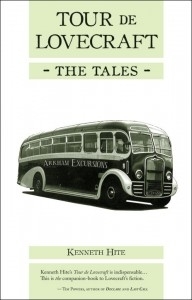 The Tour de Lovecraft alternately ambles and careens through all fifty-one of the Master’s horror tales in chronological order from “The Tomb” to “The Haunter of the Dark,” offering cheerful opinion, incisive literary criticism, playful speculation, and the occasional unhinged rant. It’s a response to Lovecraft, and to his occasionally humorless critics, that offers you Edmund Burke’s Gothic perspective on Cthulhu side-by-side with “The Haunter of the Dark” considered as Grail quest. Praise for Tour de Lovecraft! Tour de Lovecraft: The Tales is © 2008 by Kenneth Hite. All rights reserved. Please don’t pirate this book, or the Terrible Old Man will be Terribly Upset. This title was added to our catalog on December 02, 2008.